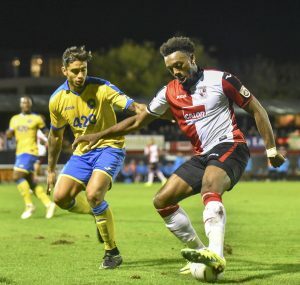 A SECOND half brace from Gozie Ugwu (pictured) confirmed Woking’s place into the first round proper of The Emirates FA Cup against Torquay United on Tuesday night, writes David Richardson. experienced centre-backs Ismail Yakubu and Brian Saah in the first 45 minutes. After impressing from the bench on Saturday, Ugwu came in for Luke Kandi as Woking lined up in a 4-4-2 formation. Nathan Blissett gave The Cards an early scare after he headed wide of the mark, before Ugwu shot into the side netting. The Cards had a golden opportunity to take an early lead when United goalkeeper Brendan Moore brought down Charlie Carter in the area. However, the Swiss- American shot-stopper saved Delano Sam-Yorke’s resulting spot-kick with just 11 minutes gone. Joey Jones replaced the injured Saah after 19 minutes and immediately switched off – forcing Brandon Hall to save well to deny Dan Sparkes. 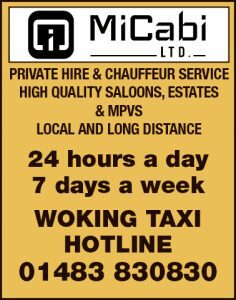 However, Woking weren’t off the hook, and they found out two minutes later when Sean McGinty’s shot hit the post, leaving Sam Chaney to comfortably tap in the re- bound. Hill would have had good reason to feel slightly aggrieved after the first 45 minutes – knowing that Woking had the better chances. Any frustrations would have been exacerbated following the injury to Yakubu. However, knowing that they had beaten Torquay 3-1 in the league last month, The Cards still had a psychological advantage over their seaside opponents. So when Ugwu turned the ball home in the 58th minute for the equaliser, the turnaround was well under way. And just four minutes later The Cards were ahead as Ugwu rose tallest to head in Fabio Saraiva’s corner. The Gulls still threatened, and Chaney went close with a volley before Kevin Nicholson miscued from Gaincarlo Gallifuoco’s cross. The visitors piled on the pressure in the last 15 minutes and somehow Keiran Murtagh and Jake Caprice cleared the ball off the Woking line to help see the hosts through. The Cards have been drawn away to Vanarama League North Division outfit Stockport County in the first round proper in what is a very winnable tie for Hill’s players. The game is scheduled to be played on 5 November. 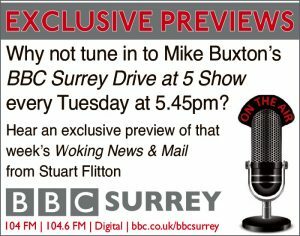 WOKING: Hall, Caprice, Yakubu (Edgar, 45mins), Saah (Jones, 19mins), Ralph, Lewis (Sutherland, 87mins), Murtagh, Carter, Saraiva, Ugwu, Sam-Yorke. Un- used subs: Terry, Kandi, Kretzschmar.